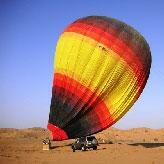 Experience the desert like no other floating over the ancient sands in a hot air balloon. 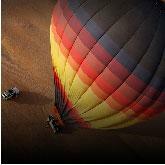 Feel the cool dawn air as you drift above the red dunes and the be awestruck as the mesmerizing landscape unfolds below with giant dunes, wandering camels, oasis and rugged mountains. Experience the magical desert dawn over thestunning desert vistas and the moonlike landscape of the rugged Hajar Mountains. 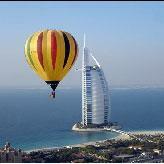 To the west take in the sights of the 21st century skyline of Dubai as you soar high into the immense blue. This tour comes highly recommended and operates only during the winter months. It is advisable to book early to avoid disappointment and is subject to weather conditions on the day.